Cindy Needham: ESS...Some Classroom Time! As many of you know I recently filmed an 11-episode class for Craftsy.com. 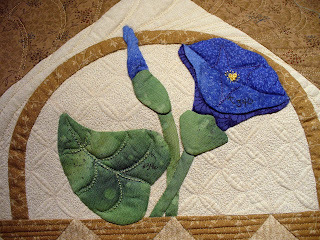 The class premiered about 10 days ago and as expected I have put my Craftsy students in a complete tail spin about ESS...stitching in the ditch "Every Stinking Seam". 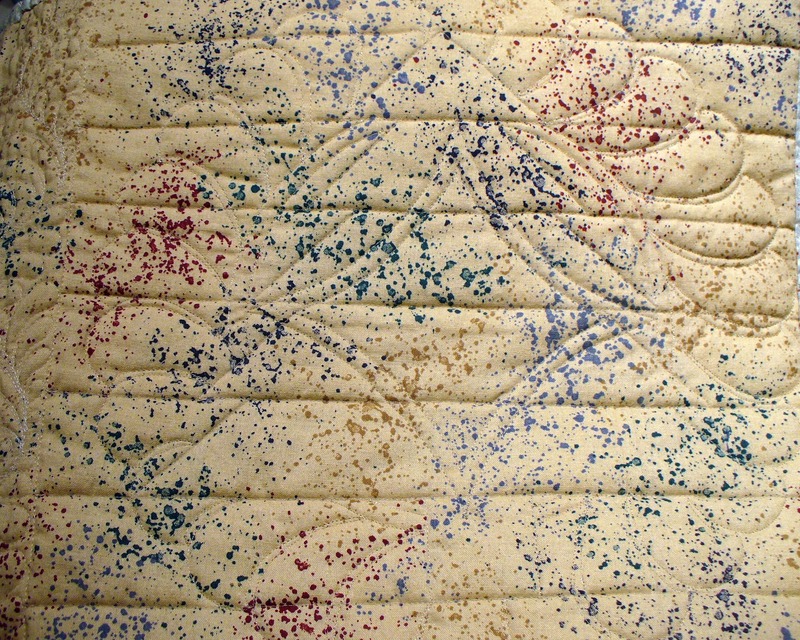 I am patiently explaining to every student that asks the importance and how good it makes your quilt look. A student asked me this morning about how it makes the back look...she said if I could only see it, it would help. That was DUH moment for me...of course! So, I am bringing my Craftsy students out of the classroom for a field trip lesson on my Blog. By posting my lesson here I can have loads of photos and explanations about why it's so important and everyone can SEE what it looks like. Nothing like a good visual! This is going to be a long post but I want to take advantage of some good classroom time. E.S.S. is my term for stitching in the ditch Every. Stinkin. Seam. It is SO important. 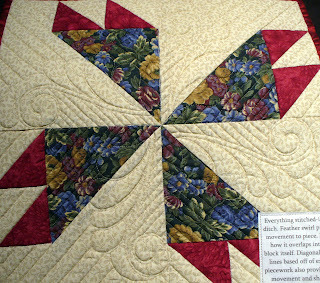 You spend countless hours piecing your quilt and many quilters want to rush thru the quilting just to get it done. 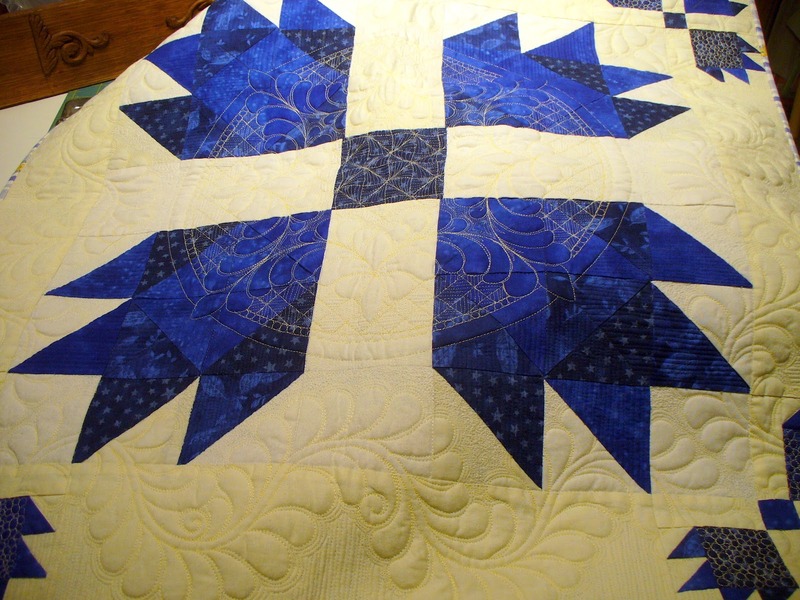 If you don't ditch, your free motion quilting will actually move and distort your seams and all that beautiful, perfect piecing you did suddenly doesn't look so good. I use a blending thread for my ditching...I use Superior Threads' Bottom Line which is a thin 60 wt. polyester and I use it in the top and the bottom. When I can't get any color to blend (when you are using sharp contrasting fabrics), I will use Superior's MonoPoly. When you have a thin, blending thread in your bobbin your ditch stitching will hardly show on the back. This is one of the class samples and one that has had a lot of discussion. 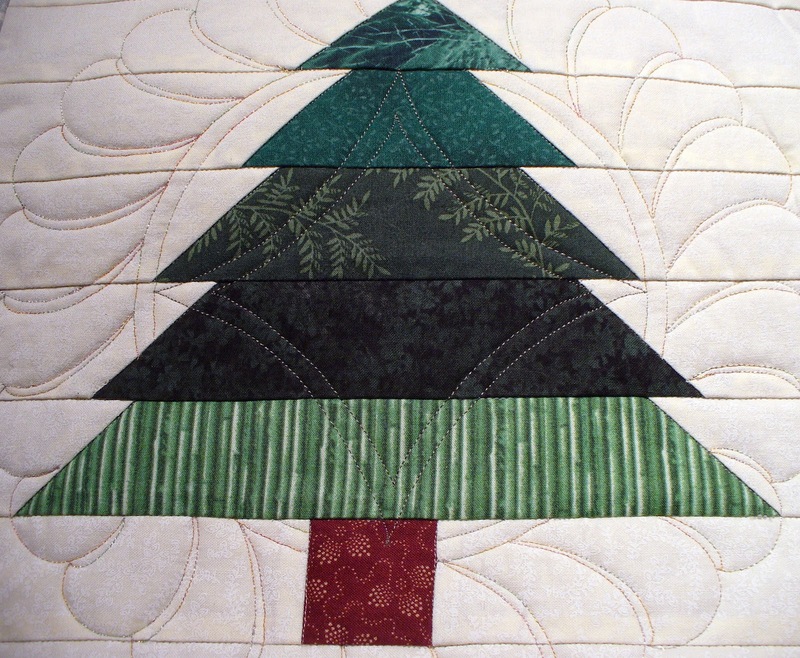 I ditched all seams..thru the pine tree and thru the white background strips and I used a cream colored Bottom Line. 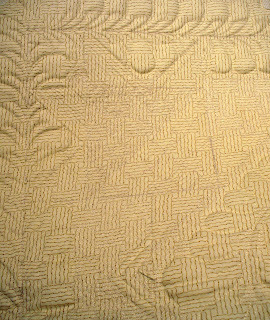 Darker cream colored Bottom Line in the bobbin...you see the ditch work but not the thread. 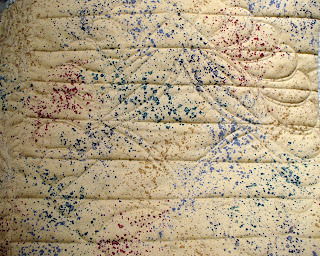 Seams are flat throughout the piece on the top...no distortion. This sample is ditched only...matching Bottom Line in top and bottom...you are seeing the ditch stitching only on the back...not the thread. 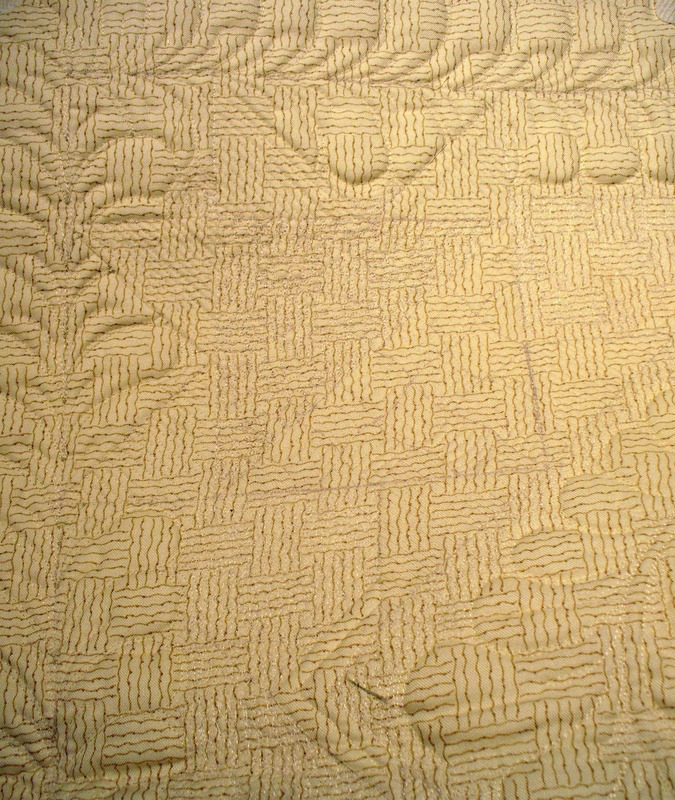 Another Craftsy sample...all ditching on the front in cream colored Bottom Line...same thread in the back. 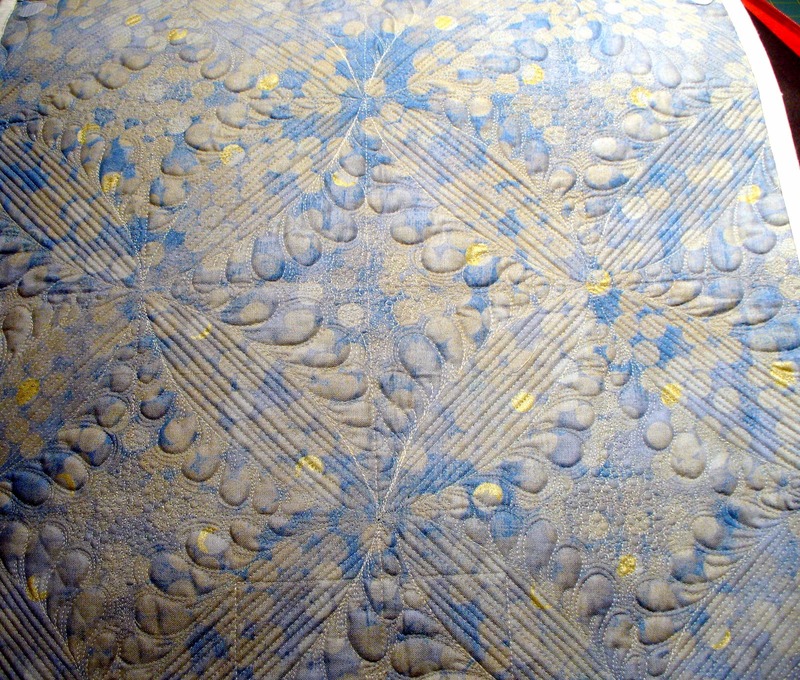 You are seeing the quilting only on the back...not the thread...the beautiful fabric still shows! All ditching done in Bottom Line thread...Bottom Line in the bobbin. 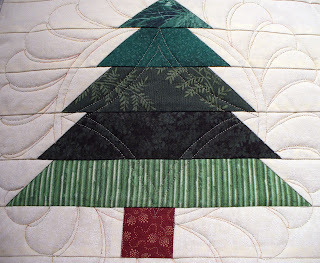 I've been getting lots of questions about ditching around applique. Here's another class sample showing how I ditched around the applique. See how it makes it pop and stand out??? Bottom Line thread was again used. This is a seam line that was NOT ditched...can you see how there is more shadow and the seam actually shows up more and detracts from the feathers??? 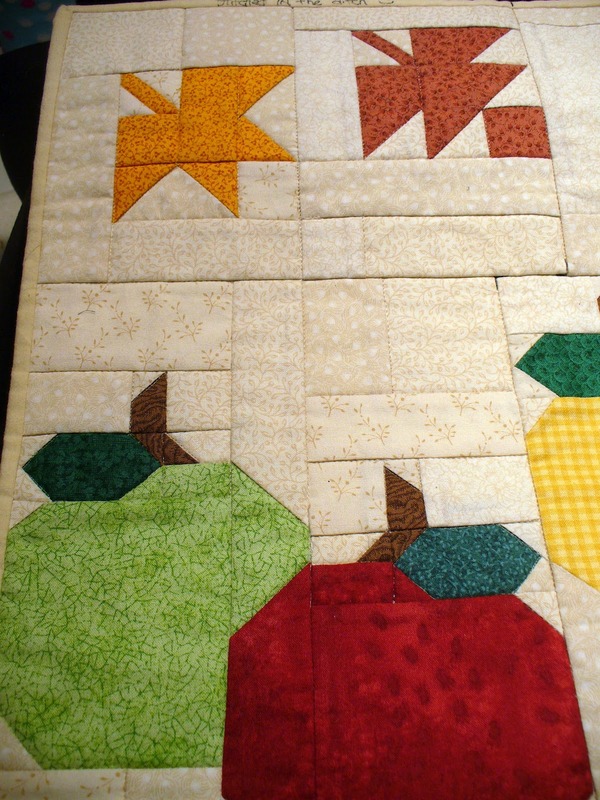 This was a VERY "creatively pieced" quilt that I managed to use for a class sample. 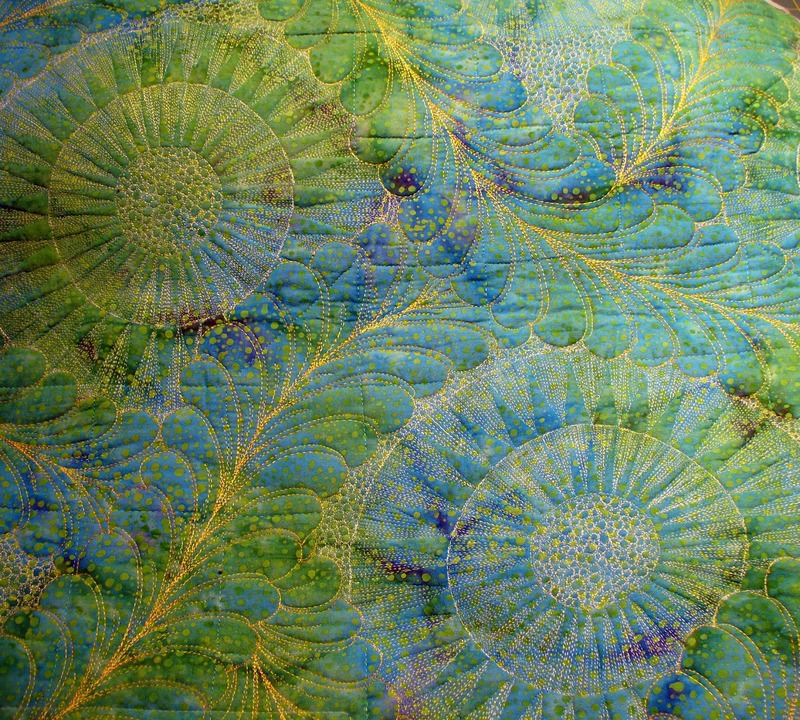 I stitched in the ditch ESS to stabilize it and then did free form feathers crossing over all of the seams trying to create a secondary movement to take the viewer's eye away from the bad piecing. It didn't work...still looks bad. But, this turned out to be a great teaching sampler. I don't think the pieced seams going thru the feathers detracts at all. 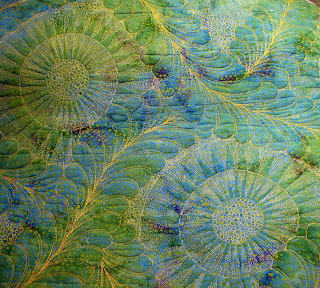 On the back I used a matching teal-colored Bottom Line thread in the bobbin for all of my ditching. 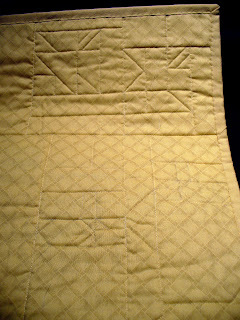 I then changed to a bright yellow contrasting thread for the rest of the quilting in the bobbin...I figured something on the quilt had to look good...it may as well be the back! 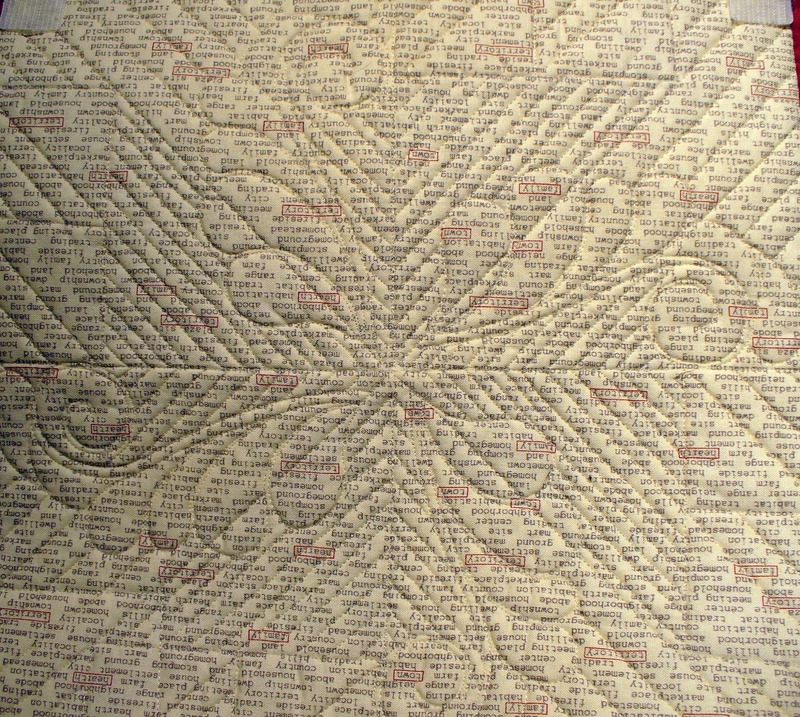 All the ditched seams going thru the feathers doesn't detract...you don't see it because the Bottom Line thread blends. Whew....I hope this helps everyone. I'm sorry I didn't think of doing this sooner as I am such a visual learner...I don't learn it unless I see it and touch it. Can't help with the touching part here though! I've just begun your Craftsy class, having only gotten through the intro and the table-basting method so far. Seeing your samples above is so very helpful since I'm right now ditching the seams on a twin-size quilt and wondering if I could get away with only outlining the 12-inch blocks and not the inner block seams. Guess not, lol! Thanks for your wonderful tutorials both on this blog, the Craftsy class and the FMQ challenge earlier this summer! how would you stablize a whole cloth since you don't have any seam to ditch? 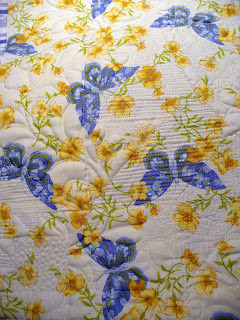 You are so right.....if I put together a quilt and it 'works' and if I am happy with the results...it's good! This discussion that has gone on over the years about what is 'right'(says who?????) and 'wrong' (see previous) with quilting processes/techniques has only served to make us second guess ourselves and beat ourselves up!! I will have to try the "ESS" tip. I have been machine basting (after doing a pin-baste) using wash-away thread and having great results. This, also, is very time consuming (but no distortion on the top or puckering on the back!!!!). Your post was super clear....thanks a bunch!!! I watched the class this weekend. 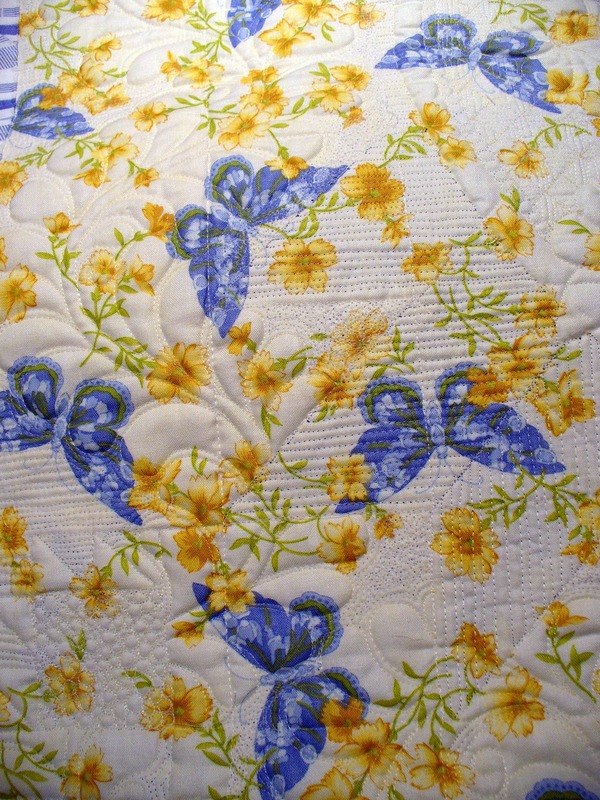 I just finished ESS'n a quilt this evening and all I can say is What a Difference ESS makes. It's also a great way to practice free motion quilting. 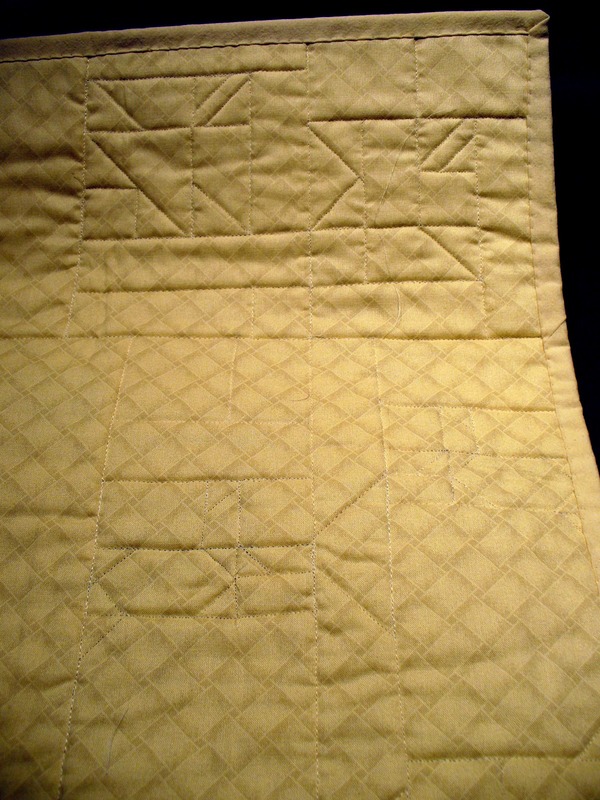 I'm new to maching quilting so I need all the practice I can get. Thanks for such a great class and for posting the pics showing the backing. This is wonderful - thanks so much! I was having visions of over exposed pictures with one picture on top of the other... This is much clearer. Thank you for this clarification. I'm enjoying your class except that my sewing machine won't sew so right now it's theoretical. Do you have a place where I could upload a photo of my bobbin with a weird tangle of thread? I have cleaned it out, made sure the machine is threaded correctly and reloaded the bobbin case and bobbin with attention to accuracy and still... grrrrr. I can see Bottom Line thread needs to be at the top of my shopping list. 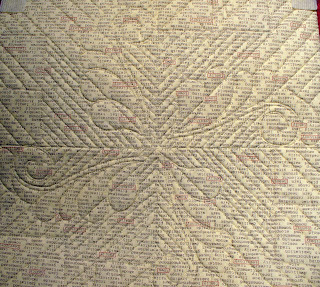 I have just begun your crafty class and when you mentioned ESS...I wondered if all that stitching was really necessary. Now I see that indeed it is. Kayla brings up a good point and I am sure the answer is in one of upcoming lessons. Thank you for this very informative post. 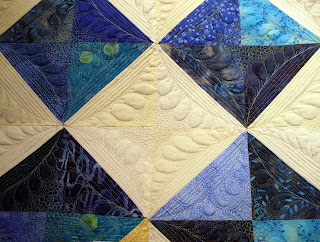 I am taking the craftsy class and enjoying it very much. After reading this post I see the advantage of stitching in the ditch. However, what do you do if you've sewn the seams open? 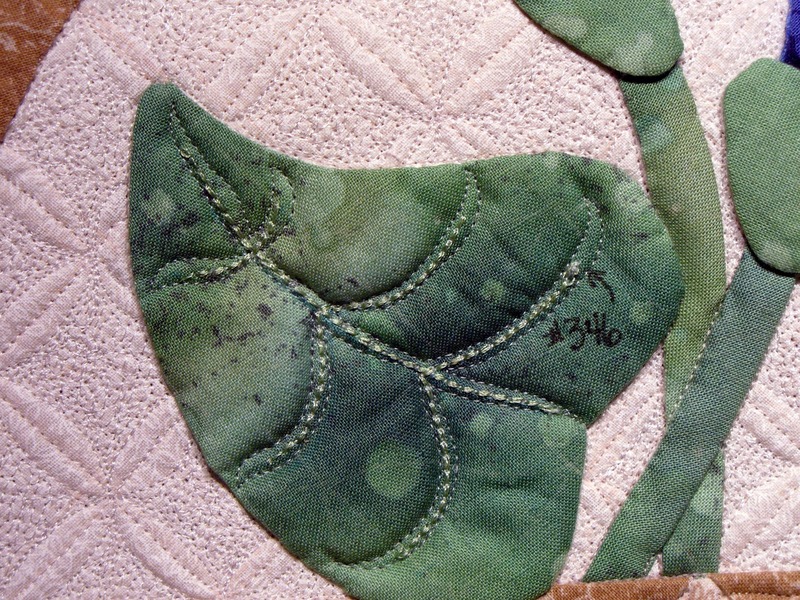 Also - is it still important to stitch ESS if you are doing an overall quilting pattern? 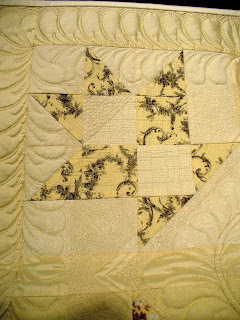 Or can you just do the main seams (between quilt and border)? Thanks! Thank goodness. ESS is classic, old style quilting, at it's best! Then add the new stuff on top, and wow! Thanks for the extra explanations on your blog. I'm watching your class on Craftsy now and it's fantastic.